While Tristan may be the heir to the House of Listar, at heart he’s more a lad than a lord. Mad with power, the ruthless and scheming Baron of Belnair will stop at nothing to gain the crown. In the dead of night, the Baron massacres Tristan’s family and burns their home to the ground. Desperate and alone, Tristan must fight for his life and his people. With everything at stake, Tristan must unite the unlikeliest of allies to block the Baron’s ascent. For the first time in his life, he must become the leader he was born to be. The Baron’s armies grow as an ancient magic stirs in the mountains. If Tristan fails, the throne, his freedom, and the love of his life will be lost forever. A Coronation of Kings is the first book in this exciting new fantasy series. 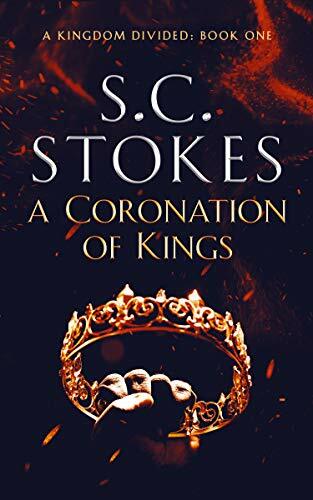 If you like fast-paced adventures, spellbinding sorcery, and wondrous new worlds, you will love Samuel Stokes’ A Coronation of Kings. Grab your copy and enter this exhilarating new world today! I love to read a fantasy novel and get lost in the worlds that the authors create. Having 3 kids, with one being a toddler, I need that escape sometimes. So, needless to say, I am always on the lookout for a book that can do that for me. A Coronation of Kings is a book that you can get lost in. From the prologue, where Lord Marcus was burying his wife who died in childbirth to the middle of the book where Tristan joins The Guild of Thieves to the end of the book…I got lost in it. Which is a good thing. The world building and the character building that the author put into this book are astounding. You can’t help but imagine the mountains, the plains, the seas, the coastal cities that are featured in this book. The storyline involving Tristan was pretty intense the whole way through. I kinda felt bad for him because he didn’t really get a break from all of the fighting throughout the book. It was one battle after another for him. But he never complained and I think he actually thrived on it. You could see the progression of his character from a carefree teen to a warrior. I loved it!!! The storyline involving Syrion was just as intense but in a different way. Syrion takes after his mother, Elaina who is an Astarii (the best way to describe her is a sorceress). The scenes where he is training and learning to control his powers were awesome. He is beyond gifted with the power of sorcery and there is also the deal with the tattoo of the golden dragon on his back (want to know what the story about that….read the book). I should also mention that Tristan and Syrion are twins. Elaina faked her death to leave with Syrion for sanctuary in Tolanis….a city that is fiercely guarded by its inhabitants. The reason she left is that Marcus’s people, the Listarii, were deeply superstitious and Marcus feared that Syrion wouldn’t be safe there if they found out about his tattoo. There are some lesser storylines that are also in the book but they really didn’t add too much to the story and most of them were wrapped up at various points in the book. The ending was pretty spectacular but the author did leave some storylines wide open. Which makes me think he is considering a sequel. Actually, I hope he is considering a sequel. Why: A wonderfully written, vivid fantasy world that you can get lost in.